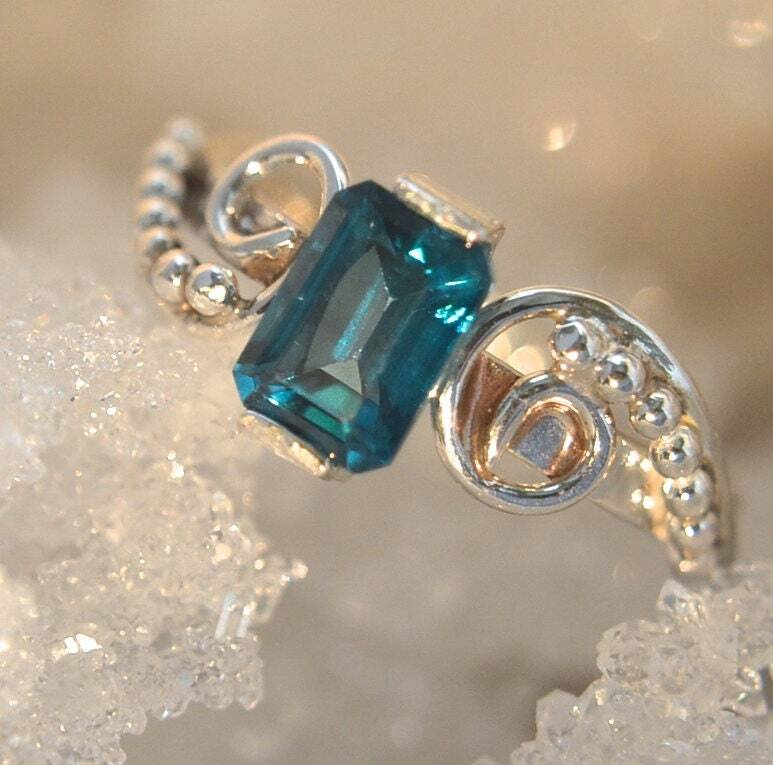 This ring features a beautiful Topaz in a unique color. Your average blue Topaz is a sky blue...so going past average, this one is a stunning deep teal blue. I've included a picture of a standard blue Topaz next to this ring so that you can compare. When you hear the term "jewel colors" this is what they mean. Rich, deep and vibrant, you don't want to stop looking at it! The stone is 7x5mm and 1.30 carats of color. It's so hard to describe the vibrance of this stone. I took a picture of it sitting on a peacock feather. Check out the little band of blue near the center of the feather. It goes from a light teal to a rich blue. This has always been my favorite color and this gemstone matches it! The Sterling Silver band is handmade by me, one little piece of silver at a time. The design is built up on a 2mm band with the gemstone featured in the center. On each side, you will find a sweeping curl and seven tiny silver balls. The palm side of the ring has a tiny secret detail that is just for the wearer. Life is too short to wear ordinary jewelry! This ring is a generous size 6.